When is a small car not a small car? I’m having a break from writing about writing. With a novel put to bed I am in short story mode for a while so my mind flits and floats like a dandelion seed. I had a Mini once. A proper one. Old style. It said Leyland on the front and was bright yellow. Like the one in the picture I found on t’interweb attached. Loved it. It was small, tiny, mini. I saw a similar one in the street yesterday. Parked next to one of the new Mini Countryman. That isn’t mini, isn’t tiny. It’s f*ing huge. I can see the lineage but really, I mean really? 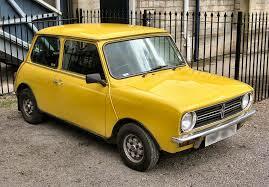 It just isn’t ‘mini’ at all. Nothing is mini. Sure it’s a good car and all. Sure it is fun to drive and has all mod cons. But it isn’t a mini. This isn’t a rant from a car purist. I’m not saying they should scrap the millions of perfectly good cars. I’m just pointing out the use of the word mini is a bit “trade description”! As for the Fiat 500 L where L is for Long. Don’t make me go there. The socks! Why the socks? Idioms! Huh! What are they good for?